Windows 10 is a great operating system, but sometimes certain bugs can occur. Speaking of which, users reported that Windows 10 can get stuck on a Welcome screen. This can be a big problem, and today we’re going to show you how to fix it. Windows 10 stuck on Welcome screen, how to fix it? 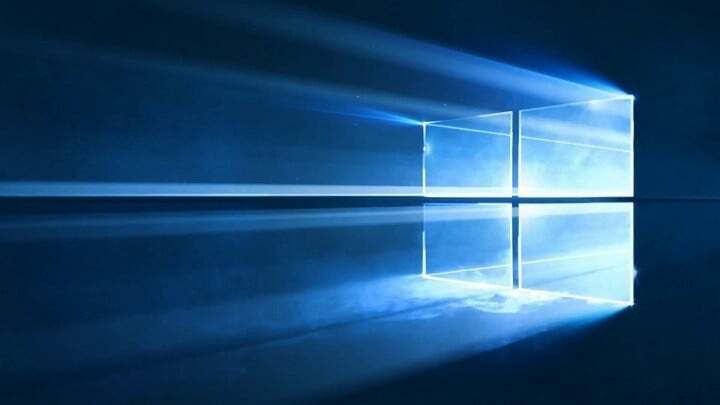 According to users, Windows 10 gets stuck on the login screen because it’s trying to connect to your wireless connection. To fix this issue, be sure to temporarily disable your Wi-Fi and check if that solves the problem. If you’re not a network administrator, you can unplug your Wi-Fi dongle and check if that solves the problem. If you don’t use Wi-Fi connection at all, disconnect your Ethernet cable and check if the problem still appears. Few users also suggest to use an Ethernet connection instead of Wi-Fi. According to them, disabling the Wi-Fi and connecting the PC directly to the router fixed the problem, so you might want to try that as well. According to users, sometimes this problem can occur due to faulty hardware. Few users reported that internal SD card reader was faulty, and that was the cause of the problem. To fix the issue, users had to disconnect the problematic device from the motherboard. 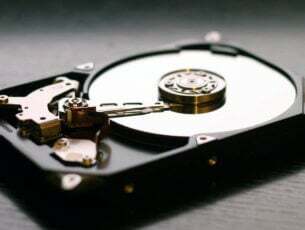 This solution might require you to open your computer case, so if your PC is still under warranty or if you don’t know how to properly remove hardware, you should try a different solution. Many users use all sorts of USB devices such as keyboards, mice, Bluetooth or Wi-Fi adapters. According to users, USB devices can sometimes cause this problem to appear. Few users reported that their PC was stuck at Welcome screen due to their USB keyboard and mouse. 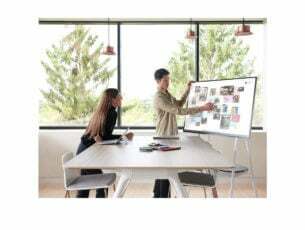 To fix the problem, you just have to disconnect all your USB devices, including your keyboard and mouse, and try to boot without them. Users reported that disconnecting all USB devices fixed the problem for them, so be sure to try that. Restart your PC while it boots. Repeat this step several times until you see Preparing Automatic Repair message. When that happens, click on Advanced options. Now choose Troubleshoot > Advanced options > Startup Settings. Click the Restart button. Once your PC restarts you’ll see a list of options. Select any version of Safe Mode by pressing the appropriate key. Services window will now appear. 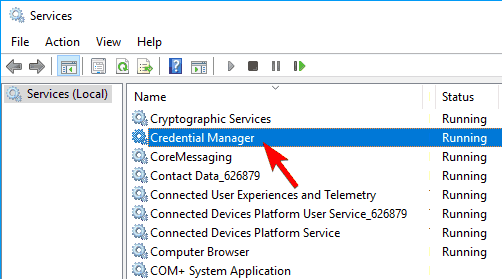 Locate Credential Manager service on the list and double click it to open its properties. 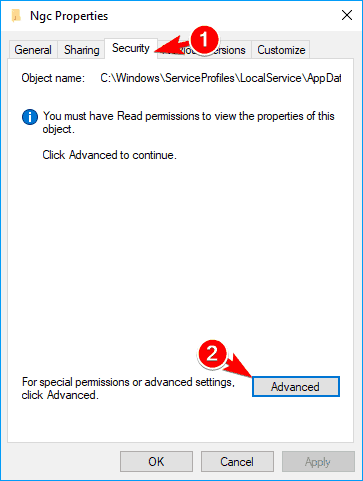 When Properties window opens, set the Startup type to Disabled and click Apply and OK to save changes. Restart your PC and check if the problem still appears. 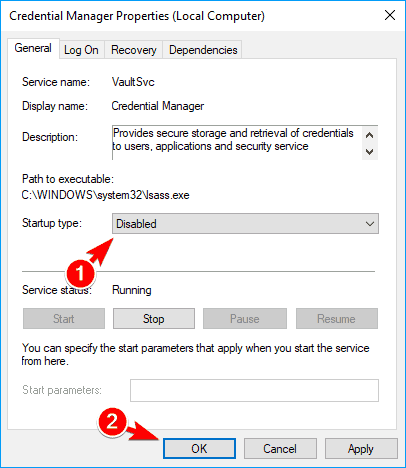 Few users claim that this problem occurred on their PC because Credential Manager was disabled, so if this service is disabled on your PC, be sure to enable it and check if that solves the problem. 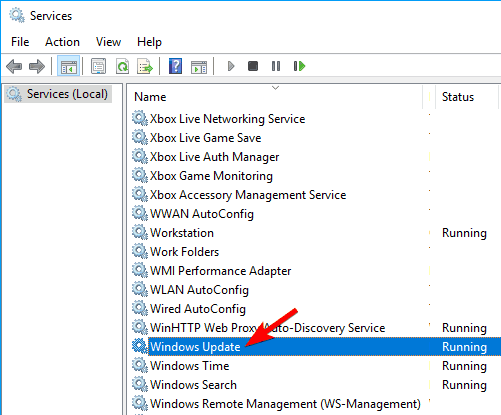 Locate Windows Update service on the list and double click it to open its properties. When Properties window opens, set the Startup type to Automatic (Delayed Start) and click on Apply and OK to save changes. After doing that, restart your PC and check if the problem still appears. Press Windows Key + S and enter control panel. Select Control Panel from the list of results. When Control Panel opens, select Power Options. Select Choose what the power button does from the menu on the left. 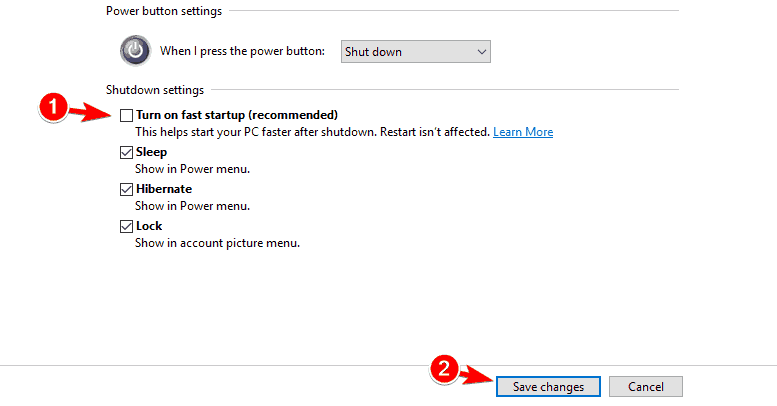 Uncheck Turn on fast startup (recommended) option and click on Save changes. After you disable Fast Startup feature, your PC might start a bit slower but the problem with the Welcome screen should be fixed. If you’re having this problem on your laptop, you might be able to fix it by removing its battery. Simply turn off your laptop and remove the battery for a minute or two. Now insert the battery back to your laptop and check if the problem still appears. If you have an extra laptop battery, you can try replacing your old battery and check if that helps. 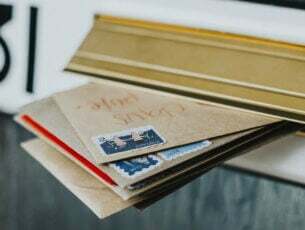 Everybody uses third-party applications, but sometimes these applications can interfere with your operating system and cause this and other problems to appear. Several users reported that SmartPass application was responsible for this problem on their PC. To fix the issue, you need to start Windows 10 in Safe Mode and uninstall the problematic application. After removing the application, check if the issue still persists. Fingerprint reader is one of the best ways to protect your PC from unauthorized access, however, certain problems with it can occur. Several users claim that this issue was caused by fingerprint reader software, and in order to fix the issue you need to remove the software. To remove the software, first you need to enter Safe Mode by following the steps from Solution 4. After doing that, uninstall the fingerprint reader software and check if the issue is resolved. Enter Safe Mode by following the instructions from Solution 4. Open the Settings app. The fastest way to do that is to press Windows Key + I. When Settings app opens, go to Update & security. 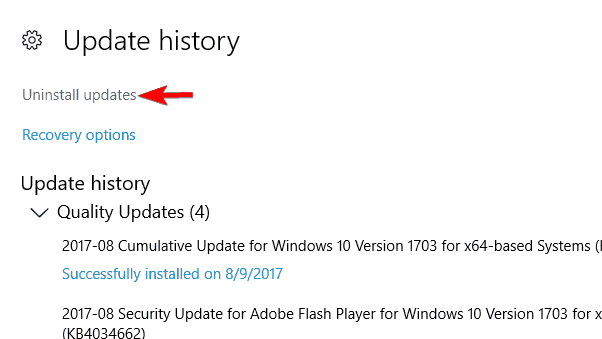 Now click on Update history. List of all recently installed updates will appear. Memorize the names of the recent updates. Click on Uninstall updates. Now you should see the list of recent updates. Locate the problematic updates on the list and double click them to remove them. 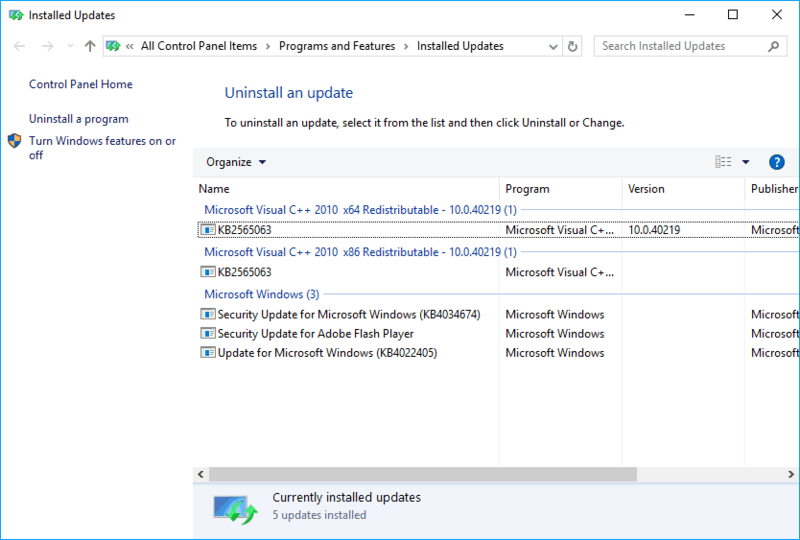 If removing the updates fixes the problem, you might want to temporarily prevent Windows from installing these updates. Start your Windows in Safe Mode. When Safe Mode starts, navigate to C:\Windows\ServiceProfiles\LocalService\AppData\Local\Microsoft\ directory. Keep in mind that some of these files are hidden so you need to show hidden files and folders. To do that, click the View tab at the top and check Hidden items. 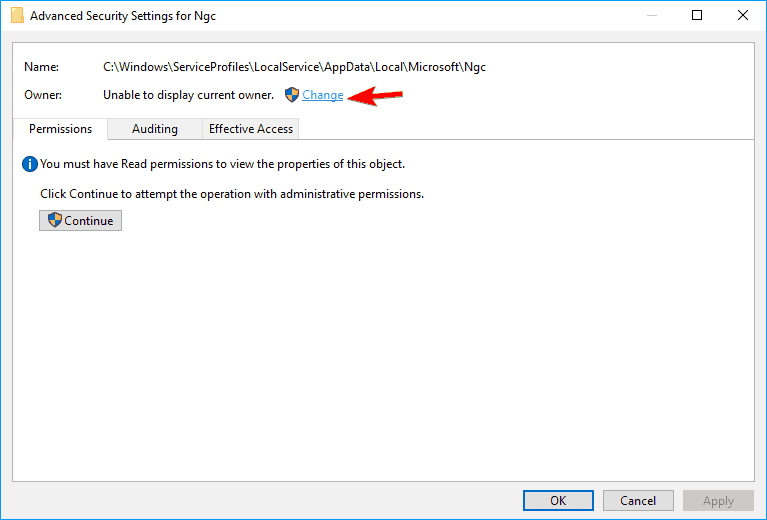 Look for Ngc folder and try to delete it. By default, this folder is protected by the system, so you’ll need to take ownership over it first. To do that, right click the directory and choose Properties from the menu. Go to Security tab and click on Advanced. When Advanced Settings window opens, click on Change in the Owner section. Enter your user name in the Enter the object name to select and click on Check Names button. If everything is in order, click on OK to save changes. 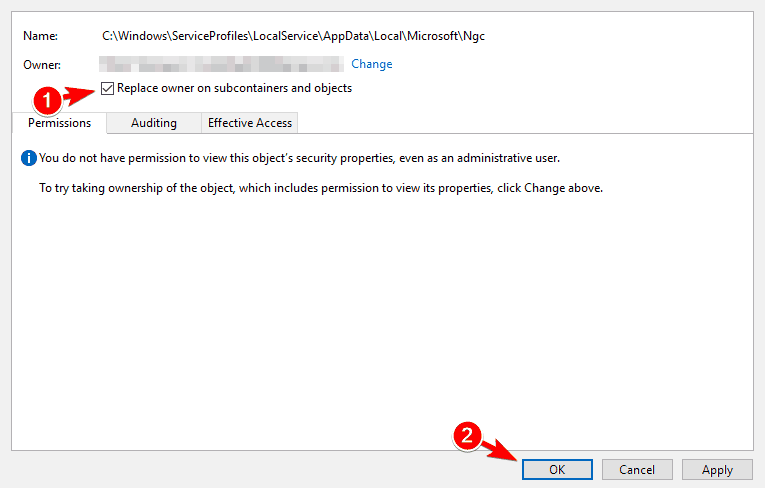 Check Replace owner on subcontainers and objects and click on Apply and OK to save changes. A security warning might appear. Click Yes to continue. After doing that, you’ll have a full control over the Ngc folder. Now you just have to delete it from your PC. Once you delete the folder, just restart your PC and the problem should be resolved. 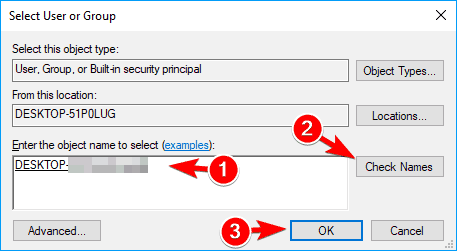 Keep in mind that this solution works if you’re using a PIN number to sign in to Windows 10. If you aren’t using a PIN, this solution might not work for you. If you’re getting stuck on a Welcome screen in Windows 10, you might be able to solve the problem simply by disabling Wireless WAN adapter in BIOS. To learn more about this feature and to see how to disable it, we strongly suggest that you check your motherboard manual for detailed instructions. Restart your computer a few times during the boot sequence. Click on Advanced options button once it appears. Now select Troubleshoot > Advanced options > Automatic Repair. Automatic Repair will now start. Follow the instructions on the screen to complete the repair. If you can’t find the Automatic Repair option, you can use Startup Repair instead. After you complete the repair process the issue should be resolved. Restart your computer a couple of times while your PC boots to start Automatic Repair. Click on Advanced options button once it appears. Now select Troubleshoot > Advanced options > Command Prompt. When Command Prompt opens, enter sfc /scannow to scan and repair your PC. This command will check for file corruption and repair it. Some users are suggesting to use chkdsk c: /f /r command instead, so be sure to try it. After the scan is completed, restart your PC and check if the problem still appears. Press Windows Key + X to open Win + X menu and choose Command Prompt (Admin) from the menu. 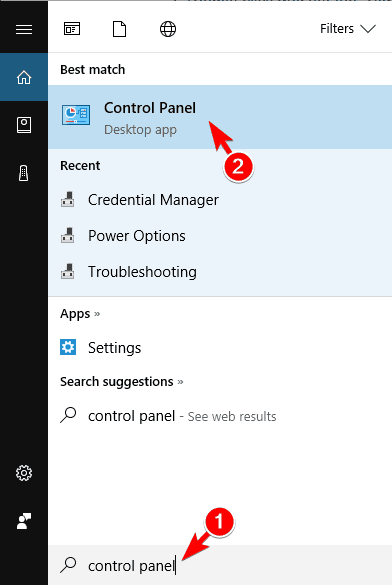 If Command Prompt isn’t available, you can also use PowerShell as an administrator. After doing that, close Command Prompt and restart your PC. Now check if the problem is resolved. Restart your PC few times during the boot until the Automatic Repair message appears. Now go to Troubleshoot > Advanced options > System Restore. Select your username and enter your password. Click on Next, select the desired restore point and follow the instructions on the screen to restore your PC. After your PC is restored, check if the problem still appears. 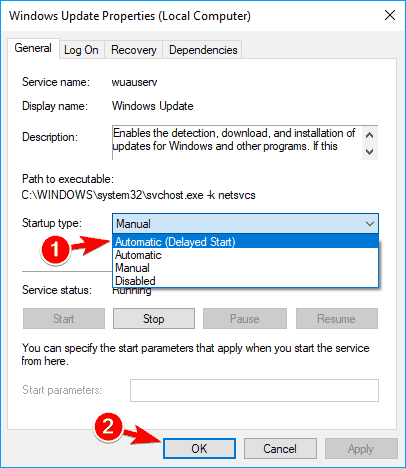 Few users claim that performing System Restore fixed the problem for them, so be sure to try it. Restart your PC few times until you start Automatic Repair. Choose Troubleshoot > Reset this PC > Remove everything. 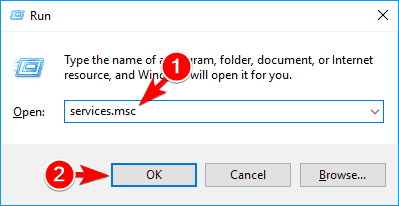 For the next step you might be asked to insert Windows 10 installation media, so be sure to have it ready. Now select your version of Windows and click on Only the drive where Windows is installed > Just remove my files. You should now see a list of changes that reset will perform. If you’re ready to start, click on Reset button. Now follow the instructions on the screen to complete the reset. Once the reset is complete, you’ll have a fresh installation of Windows and the problem should be permanently fixed. As we already mentioned, this solution will remove all files from your system drive, so use it only if other solutions can’t fix this problem. Due to certain bugs your Windows 10 can become stuck on the Welcome screen. This is a big problem, but you should be able to fix it by using one of our solutions.